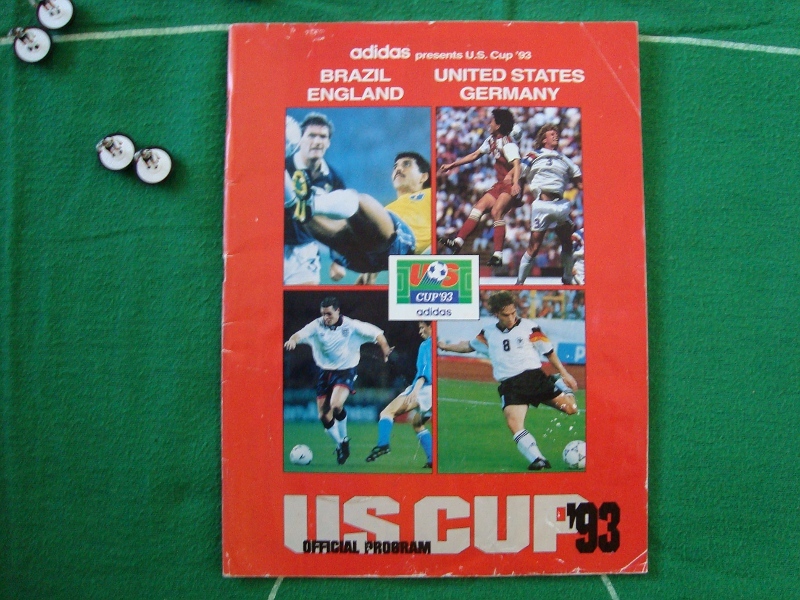 There was one official programme published for the 1993 US Cup tournament, a four-team gathering featuring Germany, England, Brazil and hosts the USA. There is no price on the 62-page journal-sized publication, from which I would make the assumption that it was presented free with the match ticket. 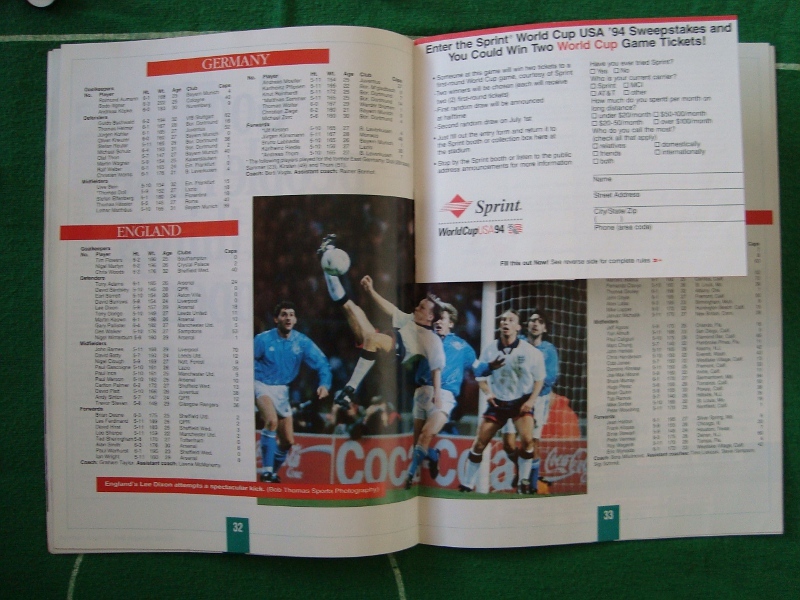 The cover features players from all four countries – the England and Germany players are Paul Gascoigne and Thomas Häßler. 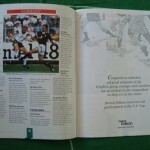 Contents include an introduction by US Soccer supremos Alan Rothenberg and Sunil Gulati, squad details and overviews, and a feature on the great games involving the four competing teams – going back to the United States’ famous victory over England in the 1950 World Cup. 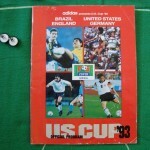 With the 1994 FIFA World Cup to be played in the United States, the country hosted a four-team mini-tournament in 1993 – the US Cup – featuring the hosts, Brazil, England and Germany. The format was a simple round-robin group format, with the team taking the most points from their three matches winning the trophy. 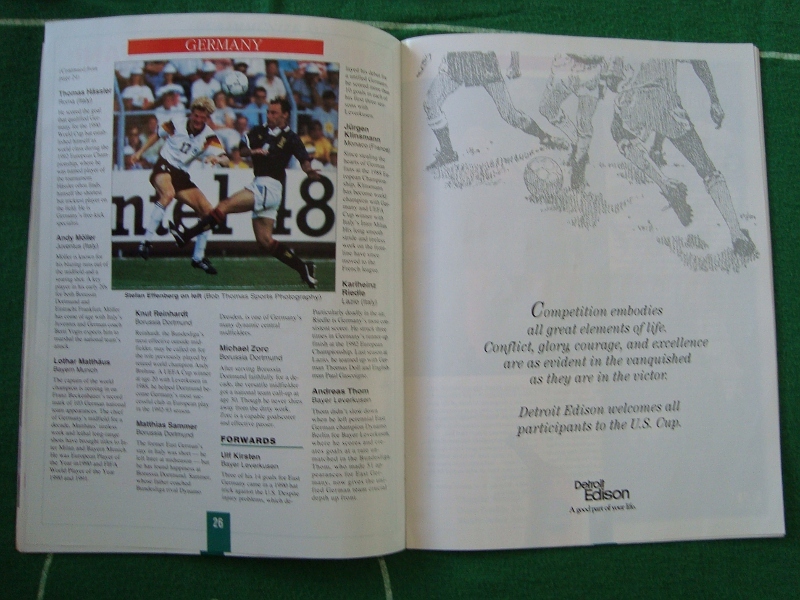 The match-up between Germany and England at Detroit’s Pontiac Silverdome was the final match of the tournament, with both teams coming into the match with contrasting ambitions. While Germany were one good game away from taking the trophy, England were on a single point playing to avoid the tournament’s wooden spoon. Berti Vogts’ side had provided the two most exciting matches of the tournament, beating the hosts 4-3 before delivering a stunning comeback from three goals down to secure a thrilling 3-3 draw with the Brazilians; England meanwhile had fallen 2-0 the US before upping their game to gain a creditable draw against A Seleção. Coming into the final game, Brazil were sitting at the top of the table with five points from their three games, followed by Germany with four from two, the US with three from three and England with one from two. With the Brazilians having one goal difference advantage over the Germans, nothing less than a win was required for the Mannschaft to overhaul Brazil and claim the trophy. Although there would be nothing directly at stake between the two teams, the match would acquire a certain historical significance in that it would be the first time either Germany or England had played a full international indoors. The Pontiac Silverdome, the home stadium of both the NFL’s Detroit Lions and NBA’s Detroit Pistons, featured a roof built of Teflon-coated fiberglass panels; usually equipped with an astroturf surface, the ground was specially overlaid with tiles of natural grass shipped in from California for the occasion – a process that would successfully be repeated for the FIFA World Cup the following year. The Silverdome would host four FIFA World Cup finals matches, with the game between between the hosts the United States and Switzerland becoming the first indoor game in the tournament’s then sixty-four year history. Graham Taylor’s England had come into their last game against Germany in September 1991 on the back of a twelve-game run; things were slightly less encouraging on this occasion: following a surprise defeat in Norway England had found themselves trailing both the Norwegians and the Netherlands in their World Cup qualifying group, and were looking likely to miss out on the finals. Despite their earlier results in the tournament Germany had not fared much better over the course of the season; although as defending champions their place at the World Cup had already been assured, their form since their defeat in the European Championship final the previous year had been inconsistent at best. In their seven games prior to the US Cup, Berti Vogts’ side had failed to put together even two consecutive victories, with their four home games including disappointing draws against Mexico and Austria and a woeful single-goal defeat in Bremen at the hands of a very ordinary Scotland side. 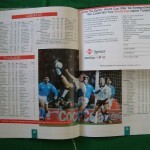 I was in the Czech Republic for this match, during what was a three-month study tour. For that, read “beer tour”. Sitting in a lightly crowded Pivnice in a suburb of the city of Plzeň full of England-supporting Czechs, it was quite an atmosphere. I had been unable to see anything of Germany’s earlier matches – I had to wait until I returned back home to watch the recordings – but by a curious quirk of fate I was able to see this one. I had been watching the opening rounds at Wimbledon with a couple of locals at the bar of a local tennis club, and when I mentioned the football one of them mentioned that they could pick up the German television channels and that a few people would be turning to watch the match. Even before kick-off, I felt I had scored a major victory. In front of a crowd of over sixty-thousand in Detroit the two sides kicked off, with Germany in their traditional Schwarz und Weiß and England in their favourite change strip of red shirts and white shorts. The free-scoring Germans pressed forward right from the start, with skipper Lothar Matthäus directing a talented five-man midfield consisting of Andreas Möller, Stefan Effenberg, Thomas Strunz and new boy Christian Ziege. The Germans were clearly setting the pace, but the best chance to open the scoring fell to the men in red. Having picked up the ball on the left just inside the opposition half, Arsenal’s Paul Merson delivered a fine lofted pass deep into the box, finding skipper David Platt unmarked in open space. Having timed his run to perfection to beat the offside trap and get ahead of the German defence Platt had only ‘keeper Bodo Illgner to beat, but succeeded in placing his firm header narrowly over the bar when it looked far easier to score. That would be as close as England would get to scoring in the first half, and Berti Vogts’ almost immediately side took full advantage of what was clearly a let-off. Given space to amble forward, Thomas Helmer played the ball inside to Matthäus, who almost casually chipped a pass forward for Effenberg who just as effortlessly collected the pass and flicked it past Gary Pallister before stroking it past Nigel Martyn with the outside of his right foot in one smooth, swift movement. Not for the first time, the Germans became complacent once they had taken the lead; rather than pressing for the second goal they sat back and allowed England to work their way back into the contest. The first real scare came from Paul Merson, whose spectacular right-footed half-volley brought the best out of Bodo Illgner in the Germany goal. The chance had come from nothing: Michael Schulz’s lazy headed clearance had fallen perfectly for the Arsenal midfielder, whose stinging shot from well over twenty yards was spectacularly tipped over the by the 1. FC Köln Torhuter. The resulting corner came to nothing, but when Effenberg was sent tumbling by Lee Sharpe the men in red once more streamed towards the German goal. Effenberg had remained down on the ground, but the tackle seemed fair enough – a view that was shared by the Uruguayan referee who waved play on. A few quick and well-executed passes later, England were level. The architect was Manchester United’s Paul Ince, whose darting run towards the German box was capped by a neat one-two with John Barnes whose sharp first-time ball beat the offside trap. Having breached the German defence Ince was able to settle himself before stabbing the ball across the grounded Illgner into the path of Platt, who couldn’t miss from less than two yards. Germany started the second half as they had the first, and could have taken the lead when a Lothar Matthäus corner evaded everyone and found Jürgen Klinsmann at the far post. Perhaps slightly surprised at getting the chance, Klinsmann met the ball on the volley and sent it high over the England goal and into the crowd. The Mannschaft soon found their rhythm again, stroking the ball around with ease in midfield with both Matthäus and Andreas Möller looking dangerous. With time running out and the trophy slipping away, the Germans started to follow up every challenge – and it was only a matter of time until a fifty-fifty ball fell their way. When England defender Gary Pallister was caught dawdling by Klinsmann, the blond striker’s quick pass found twenty-one year old Christian Ziege who charged forward with intent. After a neat exchange with Klinsmann the Bayern München man neatly side-stepped Des Walker before jabbing the ball towards the England goal; his shot was on target, but Martyn got the finest of fingertip touches to deflect the ball towards the foot of the post. It was a brilliant save, but in the end it was not quite enough as the ever-alert Klinsmann followed up to calmly to find the back of the net with a neat left-footed finish after it had come back off the upright. Having taken the lead for the second time in the match, Berti Vogts’ side would not relinquish it. For most of the remaining half an hour England were left chasing shadows as the German midfield quartet took full control with their measured short passing game and smooth distribution. Two changes were made with Matthias Sammer and Michael Zorc coming on for Andreas Möller and the excellent Effenberg respectively; the change in personnel made little difference as Berti Vogts’ side closed in on the win and the trophy, pipping Brazil to top spot with seven points from their three games – and an excellent tally of nine goals. While Germany would spend the remainder of 1993 playing a collection of warm-up matches in preparation for their return to the United States as defending world champions the following summer, England’s fortunes continue to slide. Already lagging behind Norway and the Netherlands in their World Cup qualifying group, Graham Taylor’s team were unable to fight their way back into contention and found themselves missing out on the finals for the first time since 1978. Taylor, previously branded a “turnip” by the yellow press after his side’s dismal showing at Euro 1992, finally handed in his resignation in the face of vicious media criticism: he would be replaced by Terry Venables. Plans had already been made for Germany and England to meet in Berlin in the spring of 1994, though the fixture would soon become mired in controversy over its intended date. After much toing and froing by both the DFB and FA, it was finally cancelled – becoming the “game that never was”. Neutral: played 5, won 3, drawn 1, lost 1. Goals for 6, goals against 7. Overall: played 25, won 9, drawn 4, lost 12. Goals for 31, goals against 56. Competitive: played 7, won 4, drawn 2, lost 1. Goals for 11, goals against 9.